Pearl couscous salad with feta cheese, fresh mint, and smoked paprika-lemon dressing is a delicious and easy meal to make. This simple, healthy pearl couscous salad recipe is perfect for a light summer meal or side dish. On Mondays, we deserve to be high maintenance about our lunch. Starting the work week is tough. 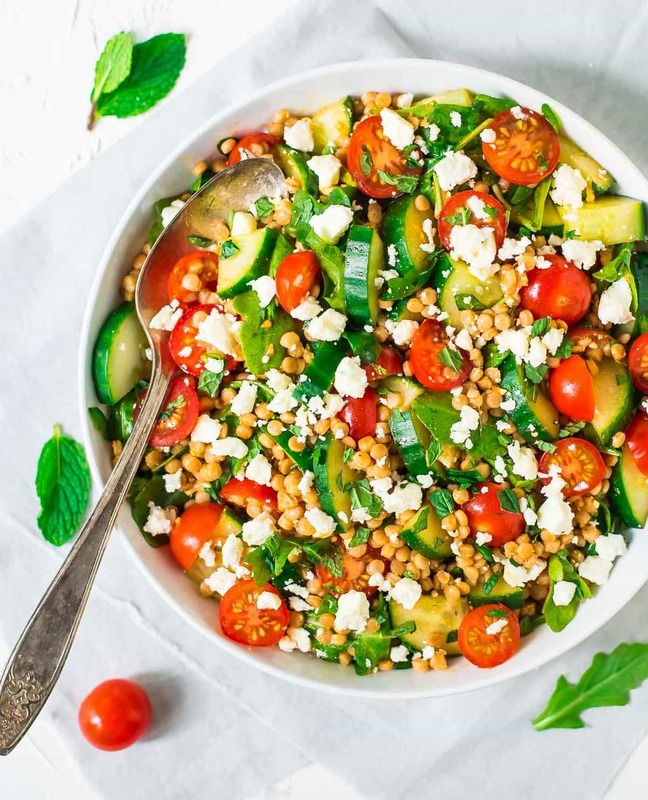 The knowledge that you have a bright container of this vibrant Israeli Couscous Salad with Feta and Mint waiting for you in the refrigerator can power you through even the most mundane of early morning meetings. Save the limp PB&J for Friday, when morale is high. Today calls for a healthy, happy, easy lunch, and this fresh Israeli Pearl Couscous Salad is here to satisfy. I am a relative newcomer to the pearl couscous party. If you are not familiar, Israeli couscous (also known as pearl couscous) is actually a small, lightly toasted pasta. It’s quick-cooking and makes a refreshing change of pace in cold pasta salads like this one. The pearls of couscous nestle into every forkful, but it’s not overly chewy and allows the other ingredients to shine. Part of the reason I was slow to adapt to Israeli couscous is that I didn’t think there was a whole grain option available. Because whole grains are higher in fiber and protein than their white counterparts (and thus more nutritious and satisfying), I prefer to use them in my cooking. Happily, thanks to my partnership with Bob’s Red Mill, I was introduced to this whole wheat Israeli couscous. It offers 5 grams of fiber and 7 grams of protein per serving (regular couscous has just 2 grams of fiber), and its mildly nutty flavor is delightful. 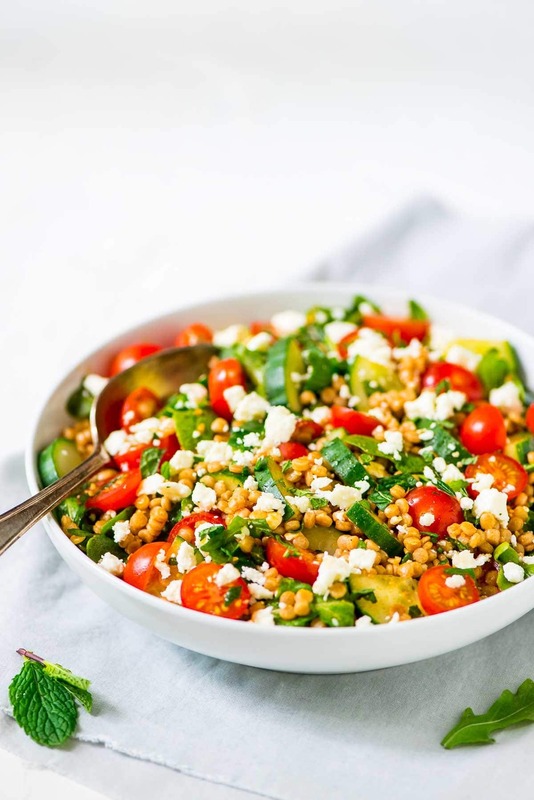 Although you could add just about any mix of vegetables to a pearl couscous salad and have it turn out nicely, I am especially fond of the Mediterranean-inspired blend that we have happening in today’s recipe. 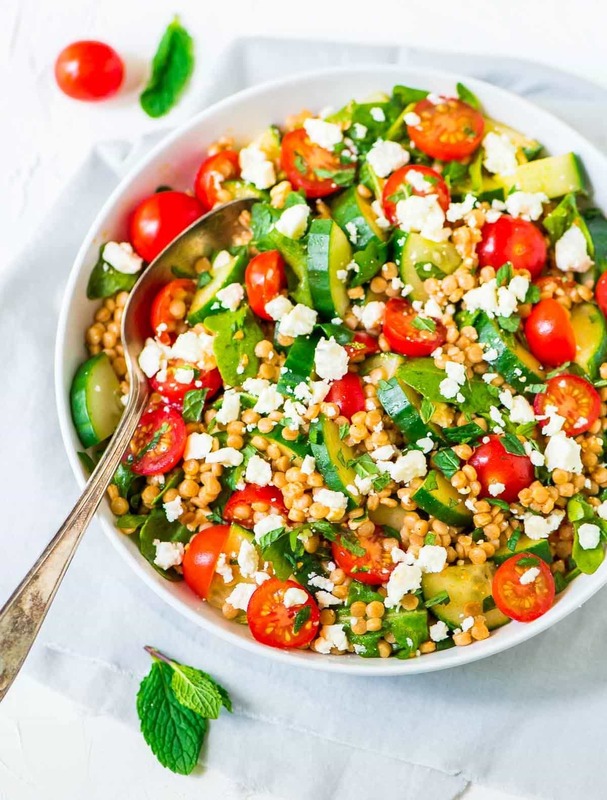 Juicy cherry tomatoes and crisp cucumber sing of summer, and peppery arugula gives the Israeli couscous salad backbone and bite. What truly makes the pearl couscous salad beam, however, are the feta and mint. Promise me you will not skip these two. The feta is creamy and satisfying, and the fresh mint makes the Israeli couscous salad taste alive. This Israeli couscous salad recipe can stand alone as a light lunch or summer side dish. To make it more substantial, I like to beef (er, bean?) it up with chickpeas, or add good-quality canned tuna. Don’t squirm, tuna skeptics—the lemony paprika dressing in this salad is a fantastic pairing with the fish, and it’s an easy, affordable source of protein too. I found that one batch of this pearl couscous salad recipe, with 7 ounces of tuna added, was the perfect amount for four lunches. Make it tonight and feel the love from the refrigerator all week long! Israeli Couscous Salad with Feta, Mint, and a smoked paprika lemon dressing. This simple, healthy recipe is perfect for a light summer meal or side. Bring 1 1/4 cups water to a boil in a medium (2-quart) saucepan. Add the couscous, return to a boil, then cover and reduce the heat to a simmer. Let cook until the liquid is absorbed, about 20 minutes. Fluff with a fork and set aside. In the bottom of a large bowl, whisk together the lemon zest, lemon juice, olive oil, mustard, smoked paprika, salt, and pepper. Taste and add additional seasoning as desired. While the couscous is still warm, add it to the bowl and toss to coat. Place in the refrigerator for 5-10 minutes to allow the couscous to cool. When read to serve, add the remaining ingredients: arugula, cucumber, tomatoes, feta, and mint. Toss to combine. Serve cold or at room temperature. Store leftover Israeli couscous salad in an airtight container the refrigerator for up to five days. 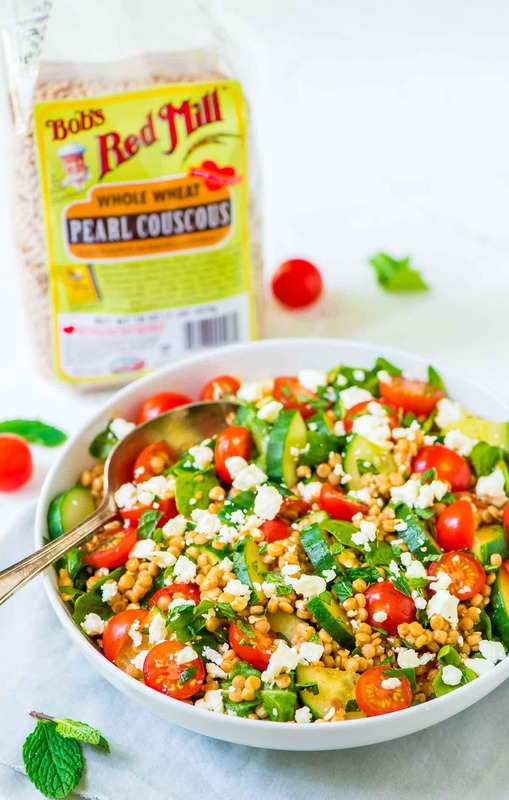 I am sharing this pearl couscous salad recipe and post in partnership with Bob’s Red Mill. As always, all opinions are my own. Thanks for supporting the brands and companies that make it possible for me to continue creating quality content for you! Israeli couscous is one of my favorite grains- this looks delicious, pinning! This looks so delicious! Definitely going to have to try it! I am totally going to make this AND maybe even branch out and add the canned tuna like you suggested. I am looking to spice up my always-salad lunches, and this looks amazing. This looks so good! I love the feta and mint combo!! Smoked paprika is one of my favorite spices as well!! Saving this for later!! Love make ahead dinners! love this! Thanks for a great idea! I made this and my family loved it. I just love couscous so much. Susan, I’m so glad to hear the recipe was a hit! Thanks so much for taking the time to stop by and leave this lovely review! I made the couscous salad last night and it was delicious! The mint really makes it special. Thank you for the recipe! Thanks so much for giving the recipe a try and taking the time to report back, Juliet! I’m so glad you enjoyed it. This is so good, and perfectly satisfying. I made it last week and plan to do so again tonight – possibly with equal parts quinoa and israeli couscous. I love anything with the feta/mint/lemon combo, and it’s an especially great, light taste sensation when the weather is as gross, sticky and warm as it is now:) Thanks! Olivia, thanks so much for taking the time to leave this wonderful review! I’m so happy to hear you enjoyed the salad. This salad was delicious, Erin! We served it with Coho salmon. Wonderful! And I could see doing it with other proteins as well. Thank you! YAY!!! I’m so so happy to hear that Sarah, and the salmon sounds DELISH. Thanks for trying the recipe and taking time to leave this wonderful review! I love this salad and have made it many times. I add roasted pistachios. My daughter, a 13 year old fairly picky vegetarian, told me to have this on rotation “at least once a week.” So it’s a winner! There is something so fresh about the mint and arugula together. Chopping them together keeps the arugula tender. I’ve also switched out the couscous for tuna and it was fabulous. Or you could do both. You can add any veggies you want. Liz, I’m thrilled to hear this recipe has become a go-to! Thanks so much for taking the time to leave this wonderful review! I’m planning on making this for a pot luck, can it be made ahead of time or should I wait to put the dressing on right before serving? Hi Jude! I think you can addd the dressing an hour or two before serving and it would taste even more delicious. I hope you all enjoy it! This looks so awesome, wondering if I made it with quinoa instead of couscous it would still work?? Thanks so much!! Hi Kristen, the salad would be a little different, but yes, you could give quinoa a try! Just follow the cooking instructions on your quinoa package and proceed from there! Fantastic recipe. I served it with Barramundi (an Australian fish) and it was amazing. I went a bit lighter on the lemon (about half what was in the recipe) and it suited our taste perfectly. Thanks so much for the recipe. SO HAPPY you loved it Sally, thank you!! Is there such a thing as too much feta? ;) I’m glad you enjoy this recipe, Kanya!